The Global Volcanism Program has no activity reports for Kazbek. The Global Volcanism Program has no Weekly Reports available for Kazbek. The Global Volcanism Program has no Bulletin Reports available for Kazbek. The glacier-covered Kazbek stratovolcano in the Caucasus Mountains of Georgia, just south of the border with Russia, has produced long lava flows down flank valleys. Next to Mount Elbrus, it is the highest volcano in Caucasus Mountains. The summit cone and the latest lava flows are of post-glacial age, and the latest andesitic-dacitic lava flow was radiocarbon dated at about 6000 years ago. Gushchenko (1979) listed an 800-700 BCE eruption. Sviatlovsky A E, 1959. Atlas of Volcanoes of the Soviet Union. Moscow: Akad Nauk SSSR, 170 p (in Russian with English summary). There is no Deformation History data available for Kazbek. There is no Emissions History data available for Kazbek. The 5050-m-high, glacier-covered Kasbek stratovolcano, the second highest in the Caucasus Mountains of Georgia, lies just south of the border with Russia. The summit cone and the latest lava flows are of postglacial age, and the latest andesitic-dacitic lava flow was radiocarbon dated at about 6000 years ago. 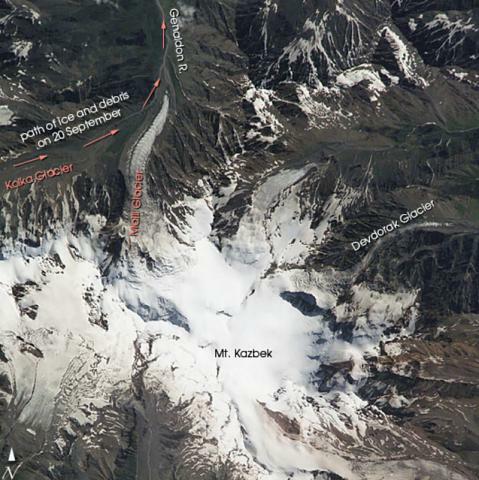 Arrows at the top left on this August 13, 2002 NASA Space Shuttle image mark the path of an avalanche and debris flow produced by collapse of a glacier the following month. Image courtesy of Earth Sciences and Image Analysis Laboratory, NASA Johnson Space Center, 2002 (http://eol.jsc.nasa.gov). There are no samples for Kazbek in the Smithsonian's NMNH Department of Mineral Sciences Rock and Ore collection. Large Eruptions of Kazbek Information about large Quaternary eruptions (VEI >= 4) is cataloged in the Large Magnitude Explosive Volcanic Eruptions (LaMEVE) database of the Volcano Global Risk Identification and Analysis Project (VOGRIPA).